The black stains are also very likely to harbor a number of molds or fungi. 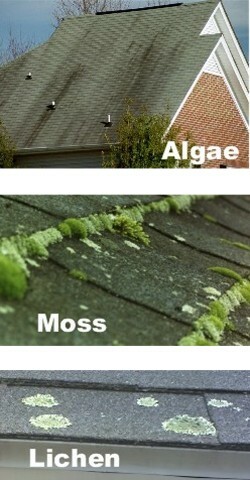 Unlike algae, the fungi on our roofs lacks chlorophyll and are unable to manufacture food from raw materials. The algae must get nutrition from some form of organic matter. To thrive, they also require a warm, humid environment. Fungi normally begin their life cycle as an airborne spore that settles on roofs. The spores on the northern exposure of the roof stand a better chance of survival because that portion of the roof is the last part to dry after a rain or morning dew. This raises the humidity on the surface of the shingle, thus creating a perfect feeding and breeding ground. The tar used in roofing is fossilized, dead organic matter and an important food source for fungi. Asphalt, at the granule base, is normally consumed first. Once these granules dislodge, accelerated deterioration of the roof itself will occur. Ceramic granules represent the outer hard shell that protects against hail and other falling debris. Ceramic granules protect against damaging UV radiation and insulate the roof against extreme heat. So you can understand that their dislodgement by the growing fungal colonies can be detrimental to our roofs’ longevity. Surprisingly, the blue-green algae are also food for the fungi. The Roof Cleaning business began becoming more common when the shingle manufactures changed from all asphalt to fiberglass shingles. The limestone in the fiberglass shingles which is added for weight attracts the bacteria and begins to spread. At times it can take up to 10 years before the Gloeocapsa Magma or “Black Streaks” become present. In Wisconsin and throughout the Midwest the black streaks will be most noticeable on the north side of your roof due to the higher moisture levels. Once the bacteria have started growing on your roof it will only get worse over time without having your shingles cleaned. Do not replace your roof because it’s not needed. Fifty Percent of roofs are replaced because of how the roof looks not because of failed functionality of the roof. If your home has black streaks it would be in your best interest to have your roof cleaned. If you let the bacteria feed off your shingles it can lead to premature roof failure. It also draws heat to your roof causing energy bills to rise. Most of all it is an eye sore and it gives off the impression of the need for a new roof. Cleaning your roof and removing those black streaks raises curb appeal and the value of your home by 5%-10%. When it comes to the cleaning application we use a low pressure high volume pump to make sure there is no damage to your roof. The last thing you want anyone to do is go up on your roof with a high power pressure washer and blast away at your shingles, that’s when the real damage occurs. We use a mixture that the shingle manufactures recommend to clean your roof. After solvent is applied we use a fresh water rinse to remove the residue from your roof. Once your roof has been cleaned the black streak are gone and your shingles will be back to their original state. When it comes to the cost of roof cleaning the average price is $300-$400 for a single family home. Prices do vary per job. 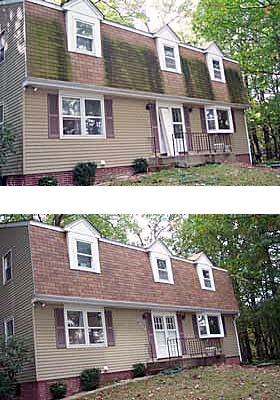 Here you can see the damage that happens when you let roof algae or roof moss grow on your roof. It attches to the shingles and feeds on your roof. If you do not clean your roof it will shorten the life span of you shingles( that is a promise). 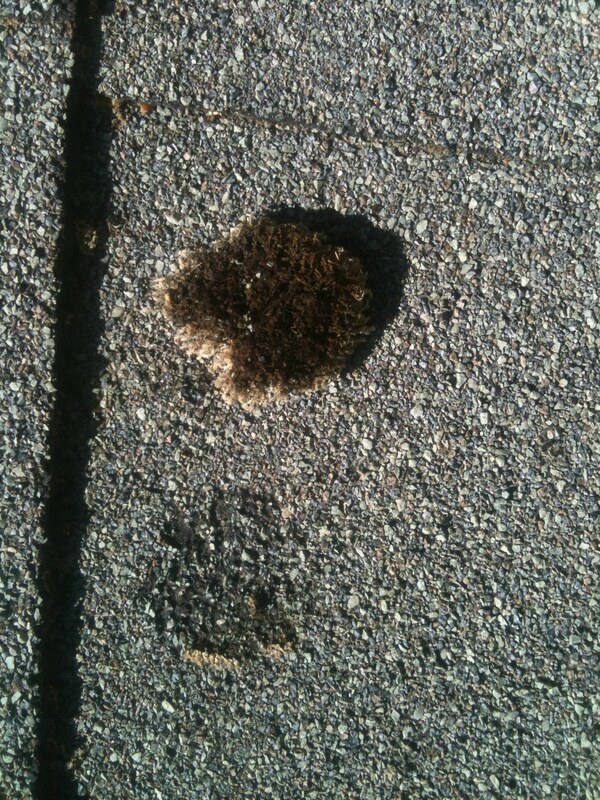 Gloeocapsa Magma is an algae that grows on your asphalt shingles. Most commonly known as the black streaks on your roof or just plain old roof algae. This type of roof algae is always black in color and found most severe on the north facing side of roofs. This roof algae is definitely an eye sore, the black stains make your roof look old and in need of replacement. Over years of algae growing and feeding off your shingles you are shedding years off the roofs life span. When we do our roof inspection before the roof is cleaned we find the side of the roof that is covered in black algae has a lot more roof granules’ in the gutter than the side of the roof that doesn’t have most of the roof algae . Which means your roof is failing due to the algae feeding on your shingles.’ Loss of granules means loss of protection and that means premature roof failure. 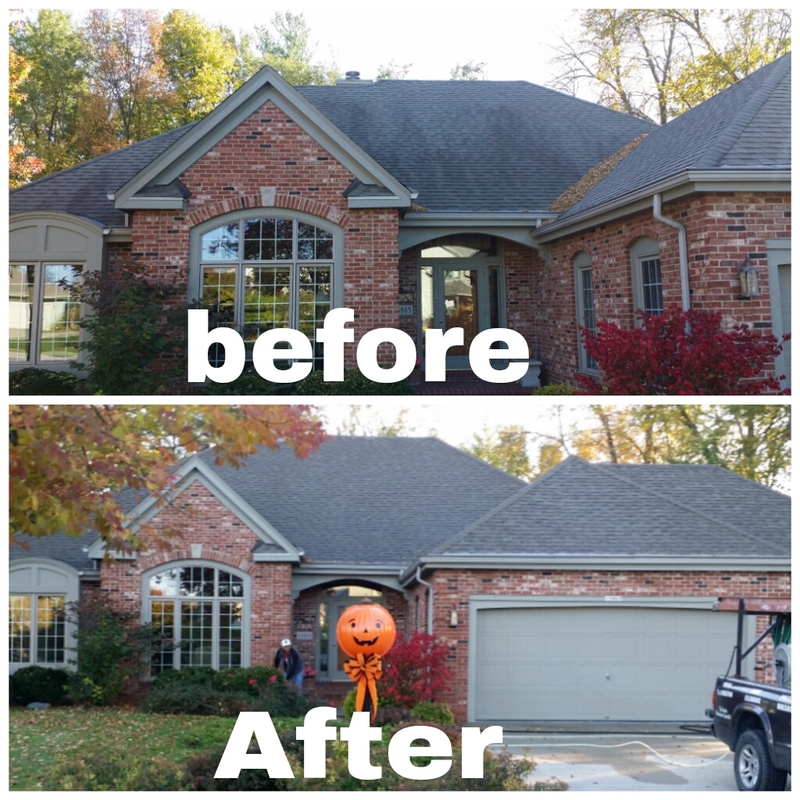 If you want the ugly roof algae killed call Midwest Maintenance we are professionals at cleaning roof streaks. Roof Lichen or just lichen that grows on your roof or whatever you want to call it. The roof and lichen do not get along. In my experience of roof cleaning Lichen does the most damage in small areas. Lichen itself is a one of a kind species, A mixture of green algae and fungus but the biochemistry of lichen is very different from either fungus or green algae. Lichen feeds on your Shingles and that causes your roof to age faster and prone to more problems if not complete failure. When roof lichen gets bad we see it take small chunks out of shingles which can cause big problems in the long run. Lichen grows its roots deep into your shingles which makes it hard to remove. Do not use any type of pressure when cleaning your roof. The proper method for removing roof lichen is to kill the lichen and let it dry, then it will fall off on its own. If you have a roof Lichen problem and would like it professionally removed we can take care of your lichen problem with a low pressure cleaning application. Then we have roof Moss. We are going to round the roof moss into a family because there are around 12,000 kinds of moss, different looks but the same biologically. Most moss looks like a green felt. 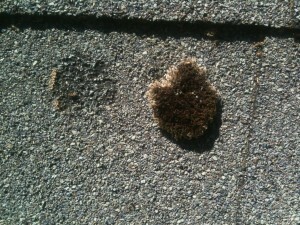 When moss grows on your shingles it tends to grow in small clumps right where your shingles overlap themselves. The trouble moss brings to your roof is moss carries a lot of moisture and that means the areas where moss is growing you have constant moisture which cause premature failure in your shingles. If you have a abundance of moss on your roof chances are you have a lot of tree covering on that side of your home or business. When any area of your home is constantly in a shaded area it is prone for moss and algae to grow in those areas. Moss affects certain building materials more than others and causes decay due to high moisture levels. When you Moss growing on your roof you need to have it removed before it starts to cause any damage. How to remove algae from the roof? Well the best way is to call a professional like Midwest Maintenance LLC. But if you want to try and attempt cleaning your roof we can lead you in the right derection. First off you need some equipment . Then you need a supplier to get your cleaning supplies from SH/TSP/ and a heavy foaming surfactant. then you have to have roughly a 150-300 gallon tank to mix the solution in . Once mixed get out the ladder and safety equipment and get up on the roof. Once on the roof apply solution to the entire roof and make sure you have someone on the ground hitting plants and sodding with water. Then get off the roof clean up rinse everything and all the algae will be clean. This is another satisfaction guaranteed service by Midwest Maintenance. If we say it can be cleaned and it you don’t see a drastic change for the good you will not pay until it’s clean. We provide low pressure,roof cleaning, black roof streak removal, power washing,throughout Wisconsin and northern Illinios. Deck cleaning in racine, kenosha,milwaukee,lake geneva,oak creek, waukegan, delavan,twin lakes, greenfeild,whitefish bay,franklin ,hales coners,delafeild,brookfeild,sussex,new berlin,mequon,cedarburg, roof cleaning in milwaukee,racine ,kenosha, all of wisconsin.